Bioinformatics is an interdisciplinary field that combines different aspects of quantitative sciences, such as Computer Science, Statistics, and Mathematics, with biological sciences, such as Molecular Biology and Genetics. Training programs in quantitative sciences and biomedical sciences have very different cultures and structures, particularly at the doctoral level. 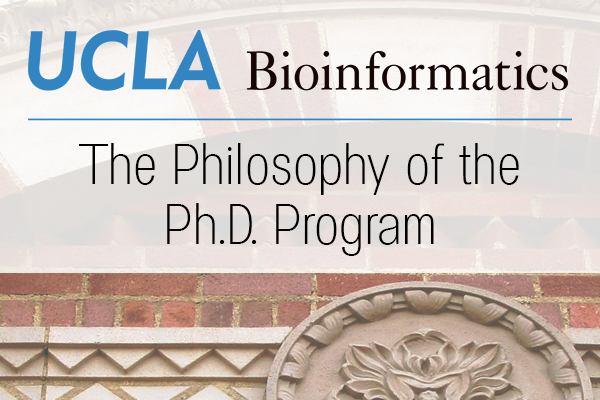 At UCLA, we aim to combine the best of both worlds with the Interdepartmental Bioinformatics Ph.D. program. We established our Ph.D. program in 2008, and we enroll 6 to 10 Ph.D. students each year. Over 45 faculty specializing in computational and experimental biology are associated with the Bioinformatics Ph.D. program, with active research and education programs spanning biology, mathematics, engineering, and medicine. The program encompasses the breadth of the growing Bioinformatics field by offering courses from over 12 departments. The Bioinformatics Ph.D. is not housed in any one department but is an Interdepartmental Program (IDP) whose faculty are members of 17 UCLA departments. The IDP is an administrative unit designed for multidisciplinary academic programs. This unit also administers the Biomedical Informatics Ph.D. program and will administer the planned Ph.D. program in Systems Biology. For many aspects of the UCLA Bioinformatics Ph.D. program, we draw upon different ideas from the cultures of Quantitative and Biomedical training programs. In traditional Biomedical science Ph.D. programs, the majority of a student’s training in applied sciences takes place through mentorship in the laboratory. Students do take some courses during their first year, but these courses mainly cover recent research in the field and are often team-taught by multiple faculty. These courses typically require only minimal work outside of class. During the first year of the Ph.D. program, these students focus on identifying a research lab to join by completing rotations in three labs. Starting with their second year, students become members of their chosen lab and perform research full time. On the other hand, in traditional quantitative science Ph.D. programs, the majority of a student’s training takes place didactically through challenging coursework. In these programs, coursework consumes at least 50% of the student’s time during their first two years. These intensive courses are usually taught by a single instructor (or sometimes a team of two) and require substantial homework assignments, course projects, and exams. However, the courses lay a foundation for the technical skills that will become the basis of a student’s future research. Students admitted to these types of programs are encouraged to join the research lab of a specific professor and start research right away. Here we describe how we combine these two cultures with the principles and philosophy that guided the design of our Ph.D. Program. Training in Methodology Development. The UCLA Bioinformatics program is uniquely focused on preparing our students to develop novel methodologies that can contribute to important biological problems. Students who are interested in methodology development are a great fit for our program. Our program is able to maintain this focus, because UCLA hosts many other Ph.D. programs that can accommodate students interested in Bioinformatics but prefer a program with a different, sometimes more traditional, focus. These include the recently established Genetics and Genomics Ph.D. program, which has focuses less on methodology development and prioritizes biological discovery. UCLA also has a broad set of other Ph.D. programs in quantitative sciences, such as Statistics and Computer Science, which also accommodate students who are interested in Ph.D. research in Bioinformatics but are primarily interested in a quantitative sciences training program. UCLA also offers Ph.D. programs in Biomathematics, Biomedical Informatics and Biostatistics for students interested in other areas of Computational Biology. In addition, a new graduate program in Systems Biology is being developed in conjunction with the Bioinformatics IDP. The multitude of programs at UCLA enable students to join a program with similar goals in terms of their training which in turn allows the programs to be organized around these goals. Our Core Curriculum Provides Rigorous Computational Training. Our core courses are structured in the style of a quantitative Ph.D. program, complete with rigorous training requirements that are met through homework assignments, exams, and course projects. The philosophy behind our courses is to teach fundamental concepts in computation and use Bioinformatics to explore these concepts. For this reason, our core courses are rigorous enough to satisfy course requirements in quantitative Ph.D. programs at UCLA, including those for the Computer Science and Statistics graduate programs. Bioinformatics core courses are taught and administered by faculty who have appointments in these quantitative departments. Six of the courses are administered by the Computer Science Department, and one by the Statistics Department. Our rigorous core curriculum appeals to students in these programs as well as students in the Bioinformatics Ph.D. program. In fact, the majority of students enrolled our core courses are from quantitative graduate programs. This diversity of academic disciplines brings to these courses a high level of engagement and creativity. Substantial Didactic Training in Bioinformatics. Similar to a traditional quantitative sciences training program, our program offers a full load of Bioinformatics Courses. Our program includes five core courses that we strongly recommended students take during their first year. These courses are: Introduction to Bioinformatics (Chris Lee), Algorithms in Bioinformatics (Eleazar Eskin), Methods in Computational Genomics (Jason Ernst and Bogdan Pasaniuc), Statistical Methods in Bioinformatics (Jessica Li), and Computational Genetics (Eleazar Eskin). In addition, students are encouraged to take during their second year Machine Learning in Bioinformatics (Sriram Sankararaman) as well as the multiple offerings of Current Topics in Bioinformatics (rotating faculty). The Current Topics courses cover relevant issues such as Data Mining in Bioinformatics or Advanced Computational Genetics. We designed the coursework for the UCLA Bioinformatics Ph.D. program so that students can take many skills-building courses comparable to those offered by a traditional quantitative science program. Rotation Program. Upon entering a Ph.D. program, students typically do not yet know whose lab they want to join. For this reason, we adopt a rotation program styled after typical Biomedical training programs. Here, students undertake three 10-week rotations; one rotation during each of the three academic quarters of their first year. Students use a rotation to try out a lab, and decide on a lab to join by the end of their first year in graduate school. Secondary, but important goals of the Rotation Program, are to develop diverse research skills, and to develop a collaborative network that may benefit the doctoral research project and career development. Seminar Program. An important aspect of Biomedical training programs is the informal training provided during seminars and journal clubs. The UCLA Bioinformatics Ph.D. program leverages informal training with a seminar that students are required to attend for the first two years of the program. In fact, the weekly Bioinformatics Seminar series has become a key focal point of the UCLA Bioinformatics community. Students also organize an annual overnight retreat where they share and get feedback on their research. Research Oriented Written Qualifier. Every Ph.D. program requires completion of a written qualifying exam, which typically occurs after coursework is completed. In traditional biomedical science programs, this exam is often preparation of a grant proposal in a topic of the student’s choice. In traditional quantitative science Ph.D. programs, this requirement is often a challenging written exam covering topics in coursework. More recently, quantitative Ph.D. programs have abandoned the written qualifier and replaced it with an exam where the students write a paper demonstrating their research skills. In the UCLA Bioinformatics Ph.D. program, we have adopted such an exam. After completion of first year courses, and faculty approval of their project proposal, students are given a one-month period to work independently on the project and to submit a written research paper reporting their results. Faculty in the program review the resulting papers. Although these projects are often small in scope because of the exam’s time constraints, the resulting papers are required to exhibit: 1) high quality in writing, 2) contextualizing the project within existing research, 3) supporting conclusions with chosen experiments, and 4) logical flow of the arguments in the paper. The idea behind the exam is not to weed out students who cannot pass it, but to set an objective bar for achievement that the students can attain. Just as Bioinformatics is an interdisciplinary field that combines methods, data, and theories from different academic traditions, the UCLA Bioinformatics Ph.D. is earned in an interdisciplinary program that combines aspects of the training cultures of quantitative and biological sciences. Our unit is a new kind of program that has been specifically designed to administer a rigorous, cross-sectional training in methodology development.